After returning to No. 1 in the world and on the back of his five big wins, Tiger Woods has once again been named PGA Player of the Year for the 11th time in his career. Woods took home the Jack Nicklaus award without winning a major by coming out on top at two World Golf Championships and the Players Championship while also winning the Vardon Trophy for the lowest scoring average and the PGA Tour money title. Woods was honored to have such a promising year. 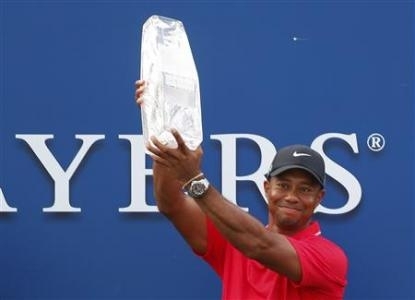 Woods had plenty of competition on the ballot as British Open champion Phil Mickelson, Masters champion Adam Scott, Fed-Ex Cup champion Henrik Stenson and Matt Kuchar also appeared, but ESPN reports that the runner-up and the amount of votes Woods received will not be revealed. Despite having more wins (42) and more majors (five) than any player besides Woods, Mickelson has never won PGA Player of the Year, the PGA Tour money title or No. 1 in the world ranking. ESPN reports that even though Woods won the Jack Nicklaus award without winning a major, it’s the fourth time in five years that the award was handed to a non-major winner. Woods joins Fred Couples (1991, 1992) and Nick Price (1993, 1994) as the only person to win multiple Jack Nicklaus awards since its inception in 1990. While those two have won it twice, Woods has made history by capturing it for the 11th time. This year marks the first time that Woods has won these coveted awards since the struggles of his personal life became front-page news in 2009, but Woods, 37, said the feeling doesn’t ever get old to him. Woods said winning the Players Championship meant a lot to him because the golf course has given him much frustration through the years. After everything that happened in 2009 and through all of his injuries, getting the accolades this year could only feel good for the golfer.